28S-WAW-SET8 is made up of several ‘28Standard’ 4Ground kits, as you would expect they have loads of detail and pre-painted parts. 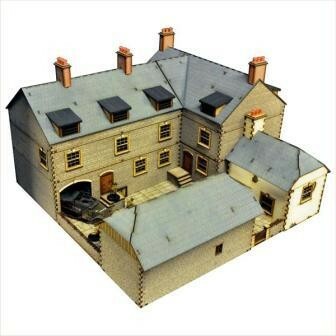 In the buildings the roofs and storeys are removable allowing maximum in-game access the interiors. They are held in place with locator lugs in each corner. This Hotel Complex will look great on any Napoleonic or Post Napoleonic battlefield, this style became common from the 1800’s onwards, with many examples from as far away as Russia to Northern Spain and Northern Italy to Britain and Scandinavia still standing today. As a part of 4Ground’s immensely popular ‘World at War’ range for WWI and WWII it makes a great defensible objective in any European action. Combining the Stone Hotel, Grand Stone hotel, Stone Coaching Stable and Cookhouse and you get an even more desirable battlefield worth fighting for! As part of a battlefield these building really help when creating an interesting scenario; either as an operational HQ on a rural roadside or as a well defended bastion in the centre of a hard fort street fight.